Big tops do not have the fabric internal linings inside, they have taller walls and also have internal poles. The wall height is great for events with live performance as it gives more head room for staging. These structures are often a great addition for themed events, fun days, festivals or for something a bit different for your wedding or party. They offer great value for money giving you a large space and lots of wow factor. Big tops are generally best built on grass surfaces as they have a large quantity of stakes that are put into the ground during construction. We are however more than happy to build on hard surfaces if you are happy for us to anchor into the ground. Big tops cannot be built using weights as an alternative to stakes. 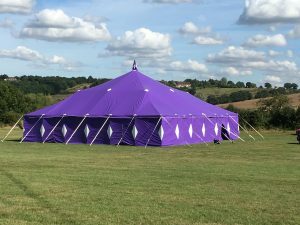 Our 18m x 18m big top is a great option for themed parties or if you are looking for something a bit different for your wedding. It gives you 324 sq m of space to play with. 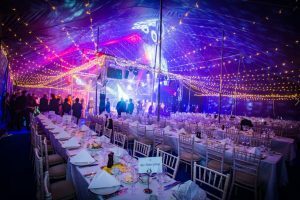 Our beautiful 18m x 27m big top gives you 486 sq m of space and will accommodate over 900 guests for a festival or party style event. The big tops do not have internal linings, but with todays lighting options you can create a real wow factor in this style structure. Here are a few answers to questions we get asked about hiring a big top. If you would like to discuss if this is a suitable option for your event please do not hesitate to contact us. How much does a big top cost? 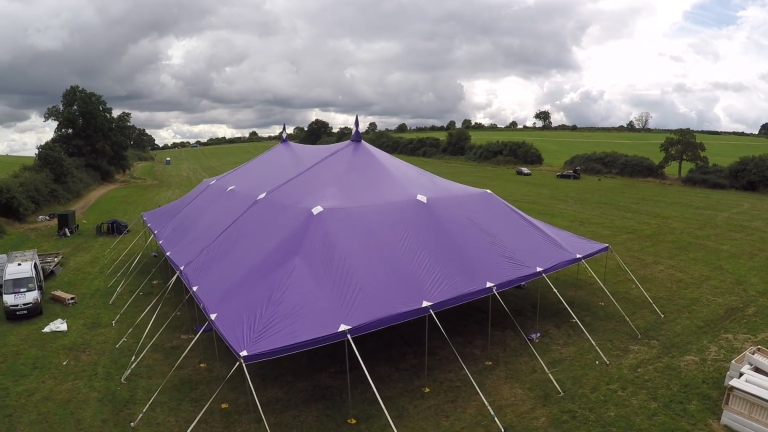 Big top prices really do range depending on how casual or formal you want your event. You can have just an empty structure or you can add in carpet, lighting and furniture. We cover Essex, Cambridgeshire & Hertfordshire. However, depending on your location we will travel further afield if required. As a general rule weekend events are delivered on a Thursday or Friday to suit you and mid-week by arrangement. Dismantle is generally on a Monday or Tuesday. We try to be flexible in regard to delivery/collection. Depending on where you are putting your big top may effect this as different sites do have their own rules on access times. We will always try to arrange convenient times with you. If the hire period required is for a second weekend (Inc. build/dismantle) an additional costs will apply. What size big top do I need? The size structure you need depends on the type of event you are planning. When considering size, you need to think about if you want your guests to be seated, standing or part and part. What additional items you would like in the structure i.e. stage, bar area or dancefloor. We generally advise no more than 2 people per sq m for standing. We are happy to help, if you are unsure and would like some advice deciding please contact us. Tent Planner is an interactive tool that enables you to design your own event with MHC Events. It enables you to choose the type of tent you would like, position the tent at your event location using a Google Earth image and design the layout of the contents such as furniture, dance floors, toilets and bars. Once you have finished designing the layout of your event, fill in your contact details and press send. This sends your event plan directly to MHC Events to provide a quotation on. Please note sizing is a guide only, adjustments may be necessary depending on internal items required. If viewing on mobile turn phone sideways to read. Prices below show big top, event flooring and lighting prices. You may just want to just hire an empty structure or you may want to add in extra items such as carpet, effect lighting and furniture.